The Chinese zodiac love compatibility between the signs of the dog and ox is pretty negligible. How will these two work out in the long term is a very tough question! Will they be able to have an easy relationship? Or will their differences cause them any problems? Will it take a lot of hard work for them to have a successful relationship? The dog will be especially appreciative of the honorable ox as they tend to be somewhat anxious. They have issues when it comes to trusting others so they will adore the ox’s steady sensibility. The Chinese animal sign ox has a sense of honor and is very smart. They will not give the dog a reason to be suspicious or envious, as they are not the kinds to ever betray a lover. The Chinese zodiac dog and ox relationship can be good together whether they are friendly or romantic. They will admire each other’s faithful and honorable nature. The ox will admire the dog’s devoted sense of decency and want to be the same for them. When these two Chinese astrology signs of the dog and the ox are dating, they will each be a steady foundation for each other. Both will be able to make each other feel at ease. They can also each give a sense of stability. The ox man or woman prefers a home life that is balanced and organized. They will be a great support system for their lovers. There are times when the dogs will feel overemotional and the peaceful feeling that comes from being with the oxen, will be sure to calm them. When in love, the dog and ox can make excellent partners in bed. Sexually, they will be passionate, provided the ox doesn’t try to boss over the dog. The dog man or woman can be somewhat negative. They will sometimes give in to foolish fears but will calmed by the ox. Their relationship will not be one that needs to be concerned with either partner cheating. The dog and ox soulmates will both set the bar high for themselves. They will also expect others to meet these same expectations. In a dog-ox marriage, both can be stubborn at times. This could lead to arguments between the two Chinese signs. The ox might be more stubborn than the dog. This could contribute to them having arguments. Then again, since they really dislikes having arguments, it might not make much of a difference. The male or female ox adores materialistic things and influence. They might dislike the suspicion that the dog will sometimes have and their sense of curiosity. But they also admires the dog’s self sufficiency. They are traditional so they might get irritated with the dog being what they consider to be too expressive. The male or female dog will be good at communicating. But if they are prodded too much, then could become angry and unfriendly to be around. They will probably see their partner as being too rigid and disinterested. They are open but they are also looking to carry equal weight in the relationship. According to Chinese horoscope compatibility, these two signs might still be happy together because they genuinely enjoy each other’s company. The ox might be too stubborn for the dog in the long term. In a dog-ox friendship, these two will need to learn acceptance and tolerance in order to work through any disagreements that they have. Any arguments these two have will probably be due to each feeling they have been mistreated by the other. Immediate action will need to be taken before the only option left is a breakup! 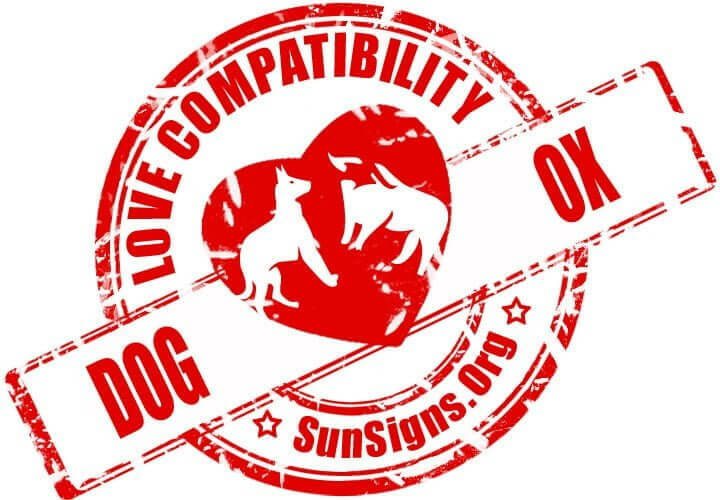 Dog & Ox Chinese Horoscope Compatibility Rated 2 Hearts!